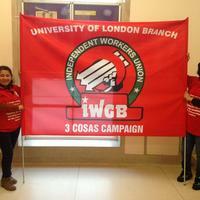 The Independent Workers of Great Britain (IWGB) union has been representing and organising staff at the University of London since April 2013 and is now the biggest branch on campus. We are a democratic, worker-led union, all our achievements are thanks to volunteer work by dedicated members and supporters. Outsourced staff members won the London Living Wage and through our widely supported 3 Cosas campaign, members also won sick pay, annual leave and pensions. So far we have made a big impact fighting for collective rights however, we need volunteers to help us take on an increasing amount of work. Most members are lower paid, migrant workers and some employers try to take advantage by ignoring the law in the hopes that no one will notice. We have grown dramatically over the past year that our resources are struggling to meet the financial demands of casework, strikes and other actions. Our funding comes from very low membership dues and donations and we need the help from volunteers to take some of the pressure off our active membership. See all available posts here.